Resource efficiency is essential if we aim to produce more from less input, use resources in a sustainable way, and manage them more efficiently throughout their life cycle. Resource efficiency is one of the core elements necessary to create a green economy in Europe and further afield, alongside waste prevention and recycling efforts, and more sustainable production and consumption patterns. The June 2016 EEA report "More from less - material resource efficiency in Europe”, presents an overview of approaches to material resource efficiency and to the circular economy in thirty two European countries, and explores similarities and differences in national policy responses. It reviews the EU policy framework for resource efficiency and analyses trends in material use and resource productivity between 2000 and 2014. The report also includes a number of considerations for the development of future policies on material resource efficiency and the circular economy. The analysis is richly illustrated with some sixty examples of countries’ own policy initiatives, described in more detail in the 32 country profiles published alongside the main report. These self-assessments, prepared by the countries in the second half of 2015, describe the status of material resource efficiency policies in each country, including the approach to the circular economy. Austria, Albania, Belgium, Bulgaria, Croatia, Czech Republic, Denmark, Estonia, Finland, France, Germany, Hungary, Iceland, Ireland, Italy, Kosovo (under UNSCR 1244/99), Latvia, Liechtenstein, Lithuania, the former Yugoslav Republic of Macedonia, the Netherlands, Norway, Poland, Portugal, Serbia, Slovakia, Slovenia, Spain, Sweden, Switzerland, Turkey and the United Kingdom. In 2011, the European Environment Agency (EEA) conducted a detailed survey to collect, analyse and disseminate information about national experiences in developing and implementing resource efficiency policies. Four years on, additional policies on resource efficiency, the circular economy and closing material loops have emerged. Responding to this, in 2015 the EEA, working jointly with the Eionet network and the European Topic Centre on Waste and Materials in a Green Economy, set out to review national approaches to material resource efficiency and to explore similarities and differences in policies, strategies, indicators and targets, policy drivers and institutional set-ups. The main objective of this initiative is to stimulate the exchange of good practice and the sharing of experiences between countries in the development and implementation of resource efficiency policies. The work also contributes to broadening the knowledge base underpinning resource efficiency and the circular economy. The approach and scope of the work were developed in close consultation with Eionet so as to reflect countries’ priorities and needs. The analysis in 2015 focused on material resources, in contrast to the 2011 work covering the more broadly defined natural resources. Following consultation with Eionet, the 2015 work focuses on policies and initiatives on material resources. The scope includes material flows entering or leaving the economy (biomass, non-metallic minerals, metal ores, and fossil energy materials) as well as secondary (waste derived) raw materials. Also within the scope of the report are the transformations that materials undergo throughout their full life cycles, including initiatives to close material loops in the context of a circular economy. To support the elaboration of the EU2020 resource efficiency flagship initiative, in November 2010 the EEA initiated a survey of resource efficiency policies and instruments in its member and collaborating countries. The work in 2011 resulted the following information available via the EEA website. Country profiles on resource efficiency policies - these thirty one country self-assessments broaden the knowledge base for the EU2020 resource efficiency flagship by describing for each country the current status of resource efficiency policies. Why is resource efficiency important? The key to answering that question lies in recognising that humanity's economic activities are dependant on the global ecosystem – in particular its capacity to provide resources and to absorb pollution and waste. Crucially, the Earth is a closed material system and that shapes the possibilities for economic growth. The EEA is well positioned to contribute to the knowledge base for decision-making on a wide range of themes related to resource efficiency, including land use, waste, energy, industry, transport and policy instruments. This section showcases the work most directly related to material use, resource efficiency and the circular economy. More from less — material resource efficiency in Europe This report presents an overview of approaches to material resource efficiency and to circular economy in thirty two European countries. It explores similarities and differences in national policy responses, with respect to policy objectives, priority resources and sectors, driving forces, targets and indicators, and the institutional setup. The report also reviews the EU policy framework for resource efficiency and analyses trends in material use and resource productivity between 2000 and 2014. Finally, it includes a number of considerations for the development of future policies on material resource efficiency and the circular economy. The analysis is richly illustrated with some sixty examples of countries’ policy initiatives, described in more detail in the 32 country profiles published alongside the main report. Circular economy in Europe — Developing the knowledge base The report describes the concept of the circular economy and outlines its key characteristics. It draws attention to both the benefits and challenges in transitioning to such an economy and highlights possible ways to measure progress. Environmental indicator report 2014 Environmental impacts of production-consumption systems in Europe. This report provides another perspective on the green economy transition, addressing the global value chains that meet European demand for goods and services. In doing so, it goes beyond previous reports and analyses to address the global dimension of Europe's economic activities. This perspective is highly relevant because European production and consumption systems rely heavily on imported resources and goods. Resource‑efficient green economy and EU policies This report highlights the major forces fostering the shift to a resource-efficient green economy in Europe, including the role of EU policies. Currently, the economic and technological changes leading towards green economy objectives across the EU economy are proceeding too slowly; what is required is a much bigger, deeper, and more permanent change in the EU economy and society to create both new opportunities and substitution processes across the economic structure. To bring this about, it is important to study and understand enabling factors and mechanisms at the crossroads of policies and real economy dynamics that could accelerate and direct the transformation. 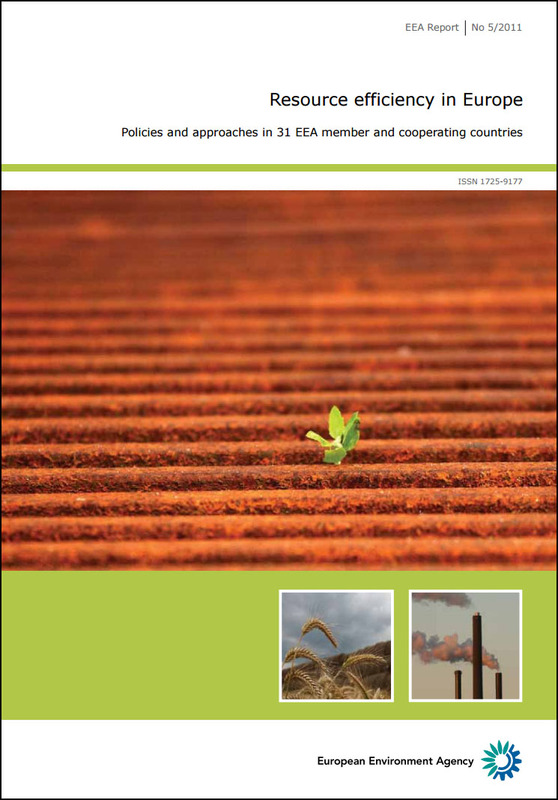 Resource efficiency in Europe — Policies and approaches in 31 EEA member and cooperating countries This report provides an overview of resource efficiency policies and instruments in 31 member and cooperating countries of the EEA’s Eionet network. A detailed survey was conducted during the first half of 2011 to collect, analyse and disseminate information about national experiences in developing and implementing resource efficiency policies, with the goal to facilitate the sharing of experiences and good practice. The report reviews national approaches to resource efficiency and explores similarities and differences in policies, strategies, indicators and targets, policy drivers and institutional setup. It concludes with some EEA considerations for development of future policies on resource efficiency at the EU and country levels. The analysis is illustrated with short examples of policy initiatives in the countries, described in more detail in the country profiles published together with the report. Synthesis The SOER 2010 synthesis provides an overview of the state of, trends in and prospects for the environment in Europe – this 222-page report integrates the main findings across SOER 2010 core elements. More from less — preliminary findings This leaflet presents preliminary findings from the 2015 EEA review of policies and approaches to material resource efficiency in 31 European countries. It has been prepared to support the European Commission’s (EC) work on resource efficiency by providing information on national contexts, but will also contribute to reflections on the circular economy. For references, please go to https://www.eea.europa.eu/themes/economy/resource-efficiency/resource-efficiency or scan the QR code.